My name is Mansfield Stringer, I'm from a little Island called, Newfoundland. Newfoundland is a province of Canada located on the most eastern part of Canada. The Island was the landing place of John Cabot in 1497. I'm not a keyboard player, at least not a good one. My passion is the guitar and programming music. 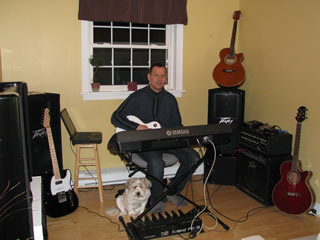 I use a PSR740 with the Roland pk5 pedals for backing and, with my friends, do a little singing. It's fun -- a good pass time. I just bought a new Les Paul custom Gibson and a new acoustic cutaway Takamine, which should keep me busy for a while. I also own a feder telecaster and my favorite is a cheap little guitar I bought for 200.00 called a Gitano. As you can tell from my selection of styles, I love country and rock & roll songs. We have a traditional Newfoundland style of music that sounds much like fast celtic, Irish music. It's made up of fast gig style with an accordion accompaniment and our traditional waltz is much like a 3/4 country waltz also using a button accordion.